This was a wonderful challenge for me. It had me looking at all sorts of things with new eyes and new awareness, considering the obvious for the first time. My interpretations morphed over and over, pondering each members' thoughts on the challenge and reconsidering my own. Traveling from my home in Florida to my new home in California last month, the flight connect through Las Vegas, NV. As we coasted in for landing, the mountains rose in the distance, farther and farther until the were merely an outline in the haze. A metaphor for our travels in life and things to come. Some gentle hills, some treacherous (shudder), they lead us on to our utopia (thanks, Betty). 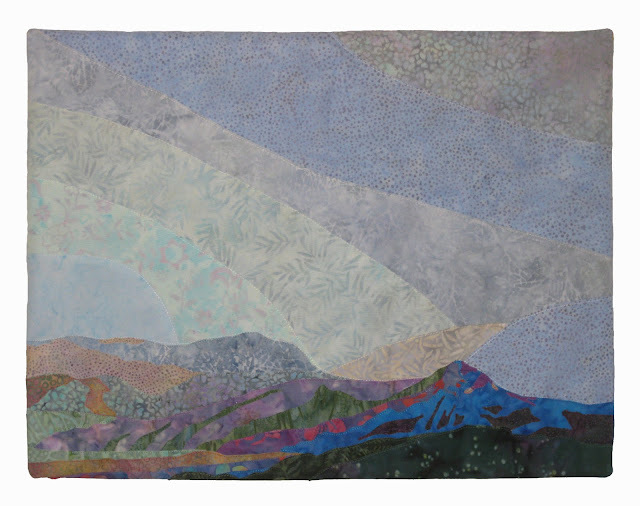 "Mountains Behind Mountains" depicts my new horizon, the San Francisco Bay looking north to Marin County. A vista that changes so dramatically with mist and fog and the setting sun. I am happy to be here. love it - it gives the feeling that ti goes on and on, just like a real horizon. bravo Martha! I can't wait to see what you create next in your new home. Oh how the mountains can mean so many different things for each of us. If this is your view- can I visit please? Martha, such a serene scene! And the colors are marvelous, so indicative of the western vista. Wonderful.